It is surprising to me how many times I have seen this done incorrectly in the field. Summing a stereo source, whether it is balanced or unbalanced is not simply twisting a couple of wires together. This will effectively reduce the impedance of the outputs by one half. 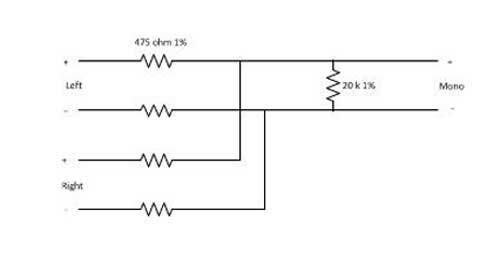 With newer, active balanced outputs, this may cause damage to the output amplifiers. Rt = 1/(1/600+1/600) or 300 ohms. It also creates an impedance mismatch with the next piece of gear, which will effect the common mode noise rejection of the circuit. Pretty easy to fabricate in the field. It is good to do things the right way, it sounds better on the air too.